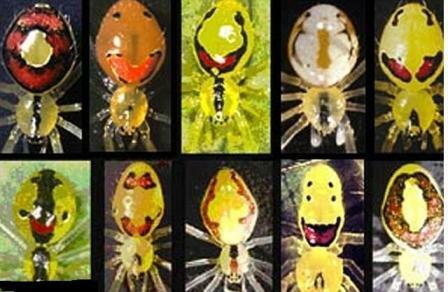 Scientifically, this tiny arachnid goes by the name of Theridion grallator – but it takes little imagination to see how it got its more popular name: the happy-face spider. Found only in rainforests in the Hawaiian islands, the spiders have a vast range of patterns and colours on their abdomens – yet all come from the same species. The spiders are 5mm (less than a quarter of an inch) long and live alone on the underside of leaves – except during their mating season and for the first 40 to 100 days of spiderlings’ lives, when they are still too young to fend for themselves. The moment it takes an aggressor to work out whether the spider is prey or not provides a vital chance of escape. However, the species, which was discovered in 1973, is now under threat from the introduction of non-native animals to the islands. The most common form – or ‘morph’ – is plain yellow and has no smile. But other variations are plentiful – the ‘red front’ morph pictured here with a cluster of her eggs is the second-most common.